For purchase of links it is necessary to add texts of links, otherwise the system will not allow you to use search engine. If you used the " Batch addition of URLs" you can skip this step, as in this case texts are added during the URL creation. Click on the number of texts near URL. Copy or write texts of links in the "Addition of texts" section. The text that will be clickable in your link must be tagged as #a#...#/a#. 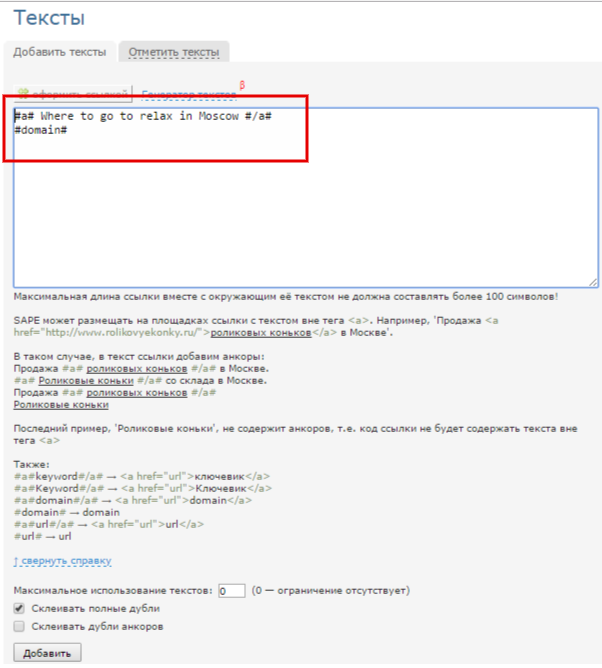 This means that when the link is placed, it will look like: "The sale of roller skates in Moscow."